Posted on Thu, Jan 12, 2012 : 8 a.m.
Fresh mozzarella was on sale at the grocery store recently, so I thought I'd buy a container and then figure out what to do with it. This is often how things work here — I don't head to the store with a plan, but rather find out what's on sale or being offered as a manager's special (on the verge of its "sell by" date and thus discounted). I bring the loot home and then write about whatever concoctions I've devised with my stellar deals. This is an elegant and sophisticated dish which gives no indication at all of being inspired by a sale item. An assortment of pantry staples such as bread crumbs, olive oil and canned tomatoes were combined with some fresh vegetables and wine already on hand. The result was a spicy sauce and some tender meatballs filled with melting cheese. It was exceptionally good! I'm proud of both my shopping skills and also of how wonderful this meal was! Make the sauce: In a medium saucepan, heat the oil over medium heat. Add the red pepper flakes, garlic, onion, peppers, fresh tomatoes, salt and pepper; cook, stirring occasionally, for 10 minutes to soften the vegetables. Add the wine and the crushed tomatoes; bring to a boil, then turn heat to low and continue simmering. Make the meatballs: In a medium bowl, combine the turkey, salt, pepper, Italian seasoning and bread crumbs; mix well. Form 6 meatballs. One by one, flatten the meatballs into small patties; place 1 cheese cube into the center, then wrap the cheese in the turkey, making sure to seal it well. Repeat until all of the meatballs have been stuffed. Heat the oil in a small skillet over medium-high heat. Add the meatballs and cook for 5 minutes, turning them frequently to brown them all over. 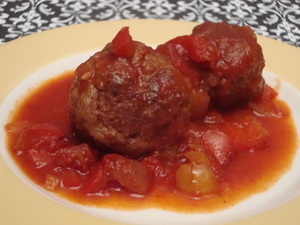 Carefully add the meatballs to the sauce, cover, and cook for 30 minutes.